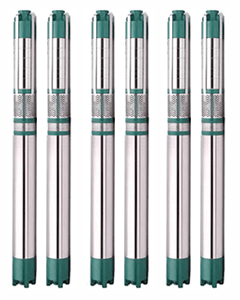 We are the topmost V3 Submersible Pump Set manufacturer & supplier of India. To offer our clients profitably operating pumps we manufacture them meticulously as per the innovativedesigns of our well-experiencedspecialists. These are made from raw-materials sourced from the dependable vendors. These are fabricated by means of cutting-edge manufacturing technology in faithfulness to the international standards of quality. These have excellent pumping proficiency thus need low operating costs. The perfect design promotes effortless assembling as well as dismantling. These are also easy to install and maintain and can work enduring toughest industrial environment conditions wide voltage fluctuations.The components of this product are accurately machined to make certain they offer problem free operation. These are light weighted, compacted and require the Lip seal as well as sand guard to avoid impurities moving into the motor. These have good durability and are preferred for applicationswidely in residential places, municipality water supply, agricultural farms & fields, different industries etc. We keep up high quality as well as reasonable pricing of our products. We are the most preferred Submersible Pump Exporter of India.